Accessibility Standards PolicyPro (ASPP) from First Reference is the only product to offer a step-by-step approach to compliance with all standards under the Accessibility for Ontarians with Disabilities Act (AODA). 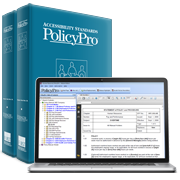 Accessibility Standards PolicyPro is designed to make it a relatively simple process for any size business to understand legal requirements and establish policies, practices and procedures on providing goods or services to people with disabilities. Updated on a regular basis, the resource contains policies and procedures that reflect the most current legislative requirements. Your 30-day trial offers the best way to assess the currency and quality of the information. Content editor Lynne Bard, HBa, CHRP, CES, has over 25 years’ experience taking the lead role in accessibility, HR and safety compliance for her clients. The manual’s legal editor, Stringer LLP, is a leader in Canadian workplace law. What should be in a standard? What is the standards development process? Why should you care about the standards development process? What are the different obligations under the AODA and the ODA? What is the future of the Ontarians with Disabilities Act? Why are people with disabilities necessary partners in the process? What if the federal government enacts an accessibility Act? What does it mean to provide goods or services to the public? What do businesses and other organizations have to do? What does it mean to have written documentation? What happens when policies, practices and procedures change? What do businesses and other organizations have to do under the general section of the Integrated Regulation? What does the information and communications standard require? Lynne Bard, HBa, CHRP, CES, has over 25 years’ experience working in accessibility, safety and human resources, taking the lead role in AODA Compliance, HR and Safety for her clients. Lynne’s expertise has won several awards of excellence in the field, lending experience and credibility to client organizations with best practice solutions and processes that lead to successful business operation. Lynne has focused her research and training on legislative compliance over the past years to ensure her clients are current with all upcoming legislation in the fields of HR management, health and safety, as well as corporate governance. Lynne has written training programs to keep her clients across the province current in compliance as well as leadership, facilitating training programs such as diversity training, train-the-trainer and mental health. Lynne specializes in mentoring and coaching leaders in the organization to assist them in their roles. Beyond Rewards was developed out of Lynne’s passion for HR and her love of helping others to succeed. Beyond Rewards provides AODA, health and safety, human resources and workplace investigations management solutions as well as a full range of training programs from health and safety to soft skills training. Suzanne Cohen Share has an MA in Health Policy and Critical Disabilities from York University, including a specialty in disability law from Osgoode Hall Law School. Suzanne is a well-known cross-disability consultant, accessibility auditor and public speaker who was on Ontario's Accessible Built Environment Standard Development Committee and has trained governments on accessibility issues. Stringer LLP is a leader in Canadian workplace law. For over 45 years, they have taken a client-centred approach to responsive service, representing employers with labour relations and employment problems. They regularly advise and represent clients on a wide variety of matters, from day-to-day issues to corporate transactions and major pieces of litigation. Their firm’s practice covers a broad spectrum of workplace law, including employment law, occupational health and safety, labour relations and arbitration, human rights, pay equity, and workers' compensation, as well as issues under the AODA. They also provide training, seminars and conferences on the above topics. Yosie Saint-Cyr, LL.B., was called to the Quebec bar in 1988 where she practised business and employment and labour law until 1999. She is still a member in good standing of the Quebec Bar Association. Yosie is one of Canada’s best-known and most-respected HR authors, with an extensive background in employment and labour law across the country. She is also the Human Resources Advisor, Human Resources PolicyPro and HRinfodesk Managing Editor. She has researched and written extensively on the AODA and accompanying standards and on similar initiatives across Canada.